The first blog : Are Shoe Lifts Safe For Sporting Activities? Are Shoe Lifts or heel lifts safe? This is a question I get asked quite often, the answer as with most things in life is not a simple yes or no. Shoe or heel lifts as quoted by wikipedia "Heel lifts (shoe lifts in the UK) are a wedge-shaped shoe insert which fits in the heel portion of a shoe, with the purpose of adding elevation under one or both feet for therapeutic purposes." Obviously these inserts will increase height and this is the purpose that the majority of people will buy them, the therapeutic purposes referred to are generally to aid with leg length discrepancy, where one leg is shorter than the other thus causing back pain or an uneven gait or stride. For leg length discrepancy shoe or heel lifts can be an excellent solution when used correctly and prescribed by a competent expert in the field. Whenever shoe or heel lifts are used, the footwear of the user will become like a ladies' high heel shoe, the heel is in an elevated position thus increasing the height of the wearer or balancing the lengths of legs that are unequal. This provides both those seeking height gain and those who suffer the painful consequences of leg length discrepancy with an answer to their woe's, however many people are prone to use these lifts without consulting a medical practitioner and so are putting themselves at risk of injury, sometimes serious injury. Imagine a lady, wearing high heel shoes and participating in the well loved sport of basketball. As is perfectly obvious to the rational thinker, the lady in question will indeed gain an advantage while standing still and attempting to make a shot but as soon as she needs to be mobile, all perceived advantages are lost, her center of gravity has been altered and she will be unsure of her footing, risking a fall or a twisting of her ankles. The same principle will apply should our erstwhile lady take to the sport of boxing. Height is considered a major advantage in this sport and rightly so but to attempt to box in high heel shoes would surely result in disaster. Maybe a darts player or someone who plays pool, billiards or snooker might benefit from the extra height supplied by shoe or heel lifts but any sports where mobility is required would surely be risking too much. 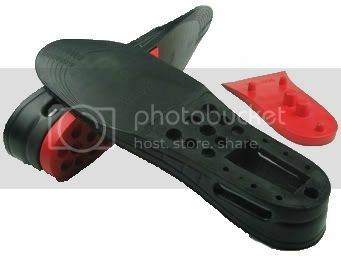 Shoe or heel lifts are an amazingly successful addition to a podiatrist's armory and have helped countless people but no medical practitioner who values their patients safety would ever advise their use during sporting activities where motion is critical. Shoe or heel lifts can safely add height when used with common sense, wearers should realize that their center of gravity will change and even walking under normal conditions will take some getting used to. Most shoe or heel lifts will fill the shoe to an extent that the ankle will protrude above the heel portion of the shoe, this portion of the shoe is designed to aid the stability of the wearer when shoes are worn. It is advised to only wear these lifts while wearing boots or shoes with an extra high ankle shroud, this will help with stability and should prevent serious injury.Adjustable Shoe Lifts are a great buy, low cost shoe lifts that offer total control and increased confidentiality.